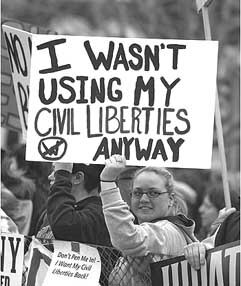 War on terrorism, or war on civil liberties? PRIME Minister Tony Blair last week lectured Britain’s Muslim community, telling it, in the run-up to the first anniversary of the 7th July London bombings, that Muslims must root out the extremists and supporters of terrorism in their midst. This is rich coming from a man who took part in instigating the shock and awe bombings of Baghdad and the illegal invasion of Iraq on the basis of a lie about weapons of mass destruction. The hypocritical lecture also came in the wake of a glut of scare stories about the alleged number of supporters of Al Qaeda among Britain’s Muslims. MI5 claims it is monitoring some 8,000 suspected Al Qaeda sympathisers. Undercover officers are spying on Muslims in colleges, mosques, internet websites and many other places, looking for those who are alleged to be “grooming” or radicalising those sympathetic to the aims of Al Qaeda. The intelligence agency also claims that some Al Qaeda sympathisers have tried to sneak their way into MI5 by responding to job adverts. This must be confusing and disturbing for thousands of Muslims in Britain. They see Bush and Blair waging an international “war on terror”, that has involved the invasion and occupation of Iraq and Afghanistan, the imposition of brutal puppet regimes and continuing death and destruction. The people of Baghdad and Kabul now face violence equivalent to the 7th July bombings almost every day. Of course Muslims are angry about this – as are millions of ordinary people around the world from all cultures and backgrounds. But if Muslims in Britain dare to voice their anger, they are in danger of being suspected of supporting terrorism. Blair has made this country a target for revenge terrorism but is now trying to shift the responsibility for policing that threat on to the Muslim community, so that if another incident occurs, he can blame the whole community. The leaders of Britain’s Muslim community have responded by producing a list of major recommendations they have made since the bombings but which have been completely ignored by the Home Office. The recommendations include holding a public inquiry into the bombings, establishing a rebuttal unit at the Department of Culture, Media and Sport to “encourage a more balanced view of Islam and British Muslims”, working with the Department of Education to combat Islamophobia, setting up an “Islam on line” website to combat extremism and others. Blair’s demands on the Muslim community also come within a week of Gordon Brown’s warning that the Government intends to try again to pass anti-terror laws that will allow suspects to be held without charge or trial for up to 90 days. This measure was defeated in Parliament at the end of last year in a revolt by backbench Labour MPs. It mirrors the 90-days law of South Africa’s Apartheid regime that allowed political activists to be held without charge or trial for three months, released for a few minutes then re-arrested and held for another 90 days. Blair and Brown both claim that the compromise 28 days detention law that was passed is not enough time for police and MI5 to find evidence to bring against terror suspects that would stand up in court. But it’s not just the backbenchers who are alarmed by Blair’s determination to turn Britain into a police state. The judges have dug their heels in firmly and refused to let the Government get away with breaching the civil liberties of suspects indefinitely. That is why two weeks ago the courts ruled against the control orders – effectively house arrest – imposed on six alleged terror suspects who had previously been held in Belmarsh prison without charge or trial for around three years. The control orders restricted the movements of these men and who they were allowed to speak to or communicate with. In all that time no shred of evidence has even been brought against them. The Government and police are also trying to recover from the egg on their face over the Forest Gate raid fiasco. The fall in support for Labour is reflected in last week’s two by-elections. In Blaenau Gwent Labour failed to retake the seat that was taken from them by veteran Labour activist Peter Law who quit the party to stand as an independent. And in the Bromley and Chislehurst seat Labour came fourth after UKIP. As the Labour conference approaches it is time for the Labour and Trade Union community to root out the real terrorists, the extremist supporters of Bush. Both Blair and Brown must go. LAST WEEKEND the Government commemorated the first ever British Veterans’ Day – a straight copy from the United States – and combined it with marking the 90th anniversary of the Battle of the Somme in 1916. In that terrible battle hundreds of thousands of young lives – French, German and British – were thrown away by greedy contending imperialist powers seeking to dominate the planet, control world trade and industry and reap the rich rewards. Inflexible senior officers ordered hundreds of young men over the top to charge at machine gun posts until they were virtually all wiped out. But last weekend we saw a view of the battle presented this country had not seen since the time of the First World War. We saw military “experts” justifying the battle and the war; presenting the Somme as a great victory for Britain and France against the Germans. These “experts” claimed that, although tactics had been poor initially, leading to unnecessary loss of life, lessons had been learned that led to better tactics in future and a great victory by the goodies over the baddies. So why, in the following year, were more thousands of young lives squandered in the hell that was Passchendaele? This was the battle that inspired Wilfred Owen to write his most famous poem, Dulce et Decorum Est, in which he described the horrific death of a young soldier from gas poisoning and then speaks of “the old lie” – that it is sweet and fitting to die for one’s country. Lenin and the Bolsheviks, along with small groups of true socialists and internationalists throughout Europe, condemned that obscene war as a slaughter of working class cannon fodder for the benefit of the rival imperialist powers of Europe. But the power of jingoist propaganda at the time was so powerful that it undermined the internationalism and working class solidarity of many lesser “socialists”. Now we see jingoism being revived to brainwash a new generation who are reluctant to enlist to die in Iraq and Afghanistan – as so many British squaddies did long ago – for the benefit of the new Anglo-American imperialism. Those who are uneasy with this culture are accused of being disrespectful of the hundreds of thousands of war dead – on the Western Front in the First World War and in Iraq and Afghanistan today. This is partly why we are having a revival of patriotic propaganda. The other reason is to obliterate the culture of the working class – a culture of friendship, internationalism and solidarity of one worker with another, wherever they come from, against the exploiters and warmongers. Margaret Thatcher led an assault on working class values with the declaration that “there is no such thing as society” and her policies fostered individualism, greed and selfishness. Last week a report commissioned to mark the anniversary of Live8, the Make Poverty History Campaign and the Gleneagles conference concluded that the lack of progress in solving the problems of Third World poverty has left many people disillusioned and, for the first time in 10 years, most Britons believe the good life is built on looking after themselves and not caring about others. The working class, united, mobilised and organised has the potential strength to smash capitalism and build a world of peace and socialism. Fragmented and individualised, workers are helpless against exploitation, alienation and being dragooned into supplying a new generation of imperialist cannon fodder. We must resist this revived culture of jingoism, xenophobia, Islamophobia, selfishness and individualism and fight it with the international working class culture of solidarity and socialism; we must stand shoulder to shoulder with our working class brothers and sisters throughout the world who are in struggle against Anglo-American imperialism. The worst insult to the dead of the Somme, of Passchendaele would be to allow the same mistakes to be repeated and allow our young people to fall for “the old lie” again.